Season after season, blush continues to be one of my favorite colors to wear! It looks great when pale and even better when tan and to me, is a "neutral". This cardigan just looked so cozy, I couldn't resist it and the fact that it came in blush was just a bonus! 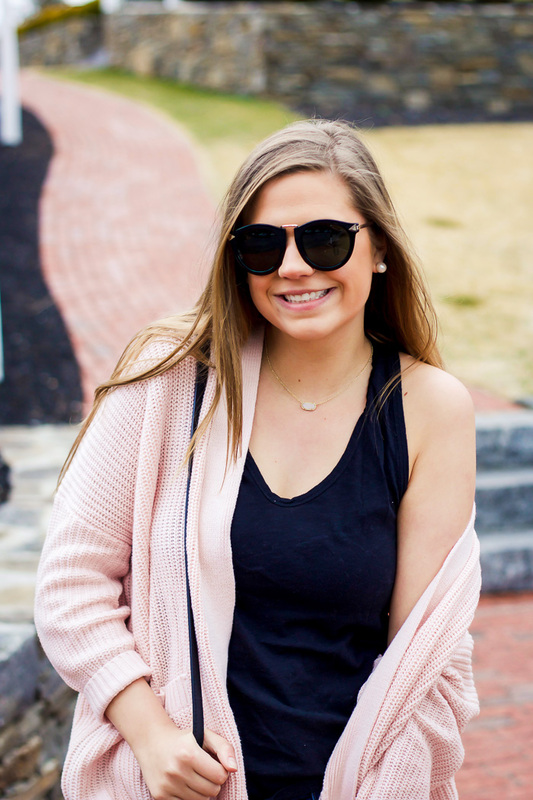 I'm not typically the "if you love it, buy it in every color" kind of person but I actually plan on purchasing more of these cardigans because I love it that much. For reference I did purchase this in a Medium and definitely could have gotten a small but I wanted it a little oversized. I think I'll try the next one in a small! We took this photos last Friday when it was pretty warm out. Fast forward, it snowed a few days ago and is back to cold! I keep wanting to sing the Katy Perry song "it's hot and it's cold..." all the time! I'm just ready for it to be consistently warm already!